Make your next event a Digital Steel event, and experience the future of steel tip. Additional information and pricing coming soon. DartConnect is taking the tournament experience to a new level for players, fans and staff. Running an event on time has never been easier, with match assignments delivered to every tablet, and results automatically returned to the control desk. Not everyone appreciates the amount of work it takes to run and promote a successful event. 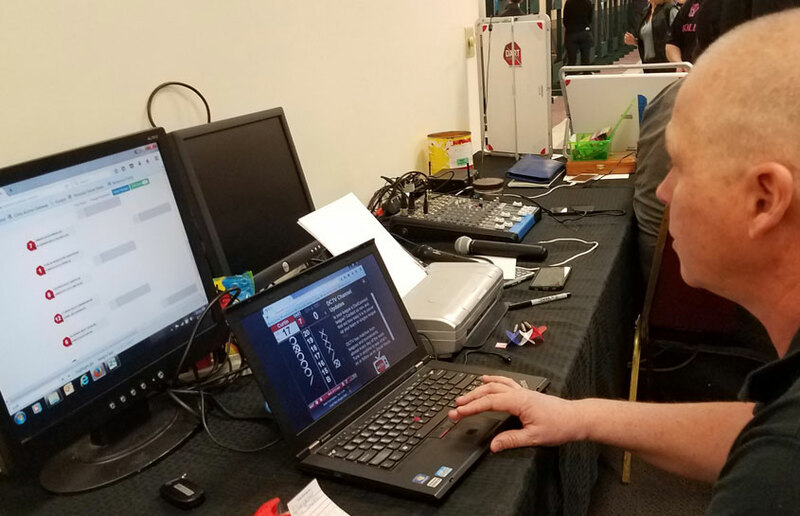 DartConnect is well traveled and knows first hand what it takes behind the control desk, as well as the front lines, to keep an event on track. Promoting the event, recruiting score keepers and running on time, are just some of the pain points we can assist with. What is a “DartConnect Event”? Already familiar with DartConnect event services? 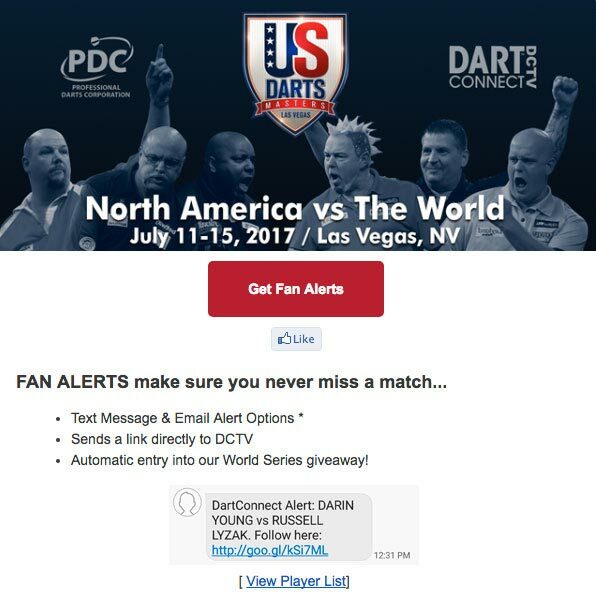 Promote Your Event with DartConnect. Don’t Let Your Events Get Behind. Now Everyone Can See The Scoreboard! Give the Players What They Want. 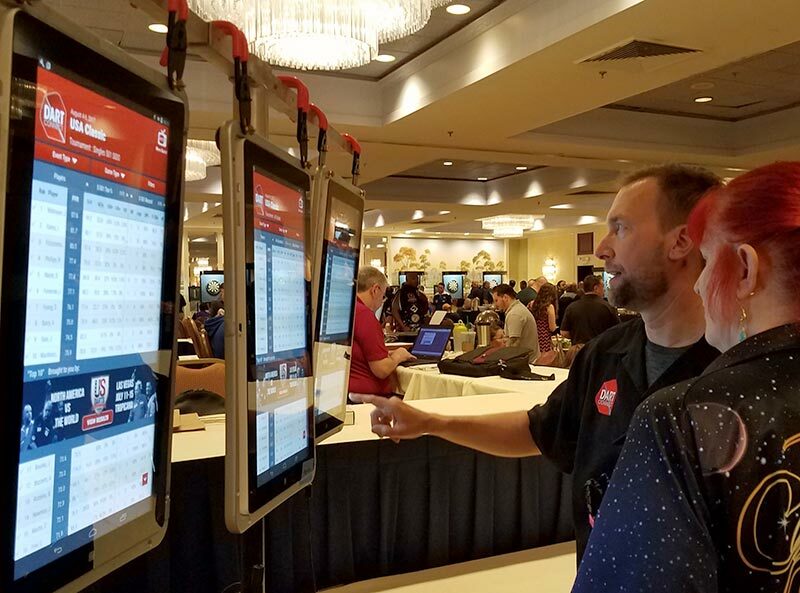 DartConnect scorekeeping results in faster matchplay, fewer errors and less frustration looking for volunteers. You’ll find more people are willing to keep score and players find “walk and chalk” much easier. Eliminate the challenge of recruiting scorekeepers. Players check-in in advance for the event on our website or onsite on any mobile device or at the control desk. This creates the shared player roster that is then shared between all devices. 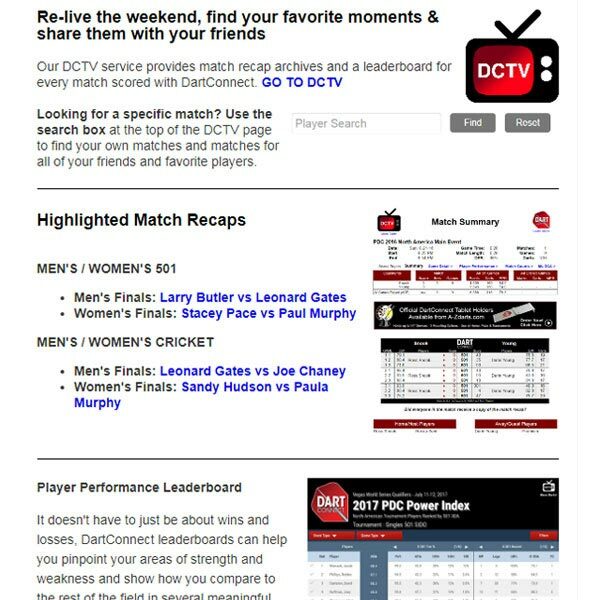 Emailed directly to players immediately following the match, the DartConnect Match Report provides comprehensive game stats providing players with instant feedback on their performance. Shareable and Facebook-friendly, these reports add a new dimension to the competition and provide fodder for bragging rights and keeping pace with rivals. 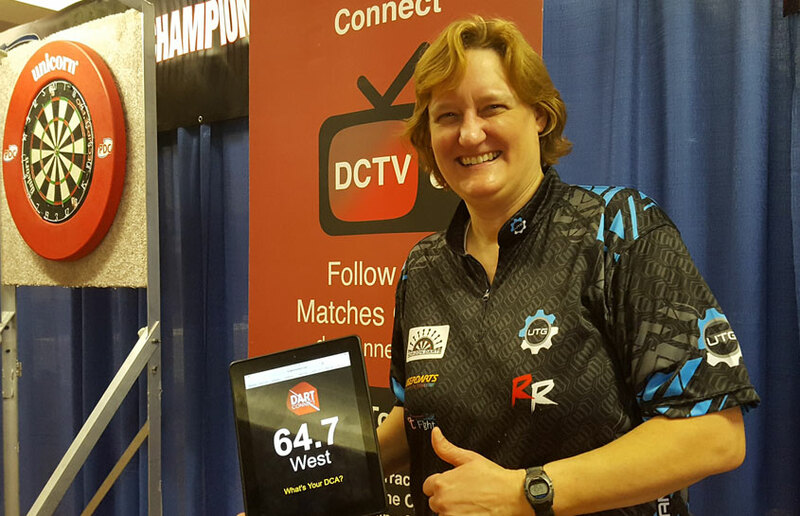 Every match scored on DartConnect is automatically broadcast on our DCTV website enabling anyone with Internet access to watch for free. Friends and fans can tune in to follow their favorite players. 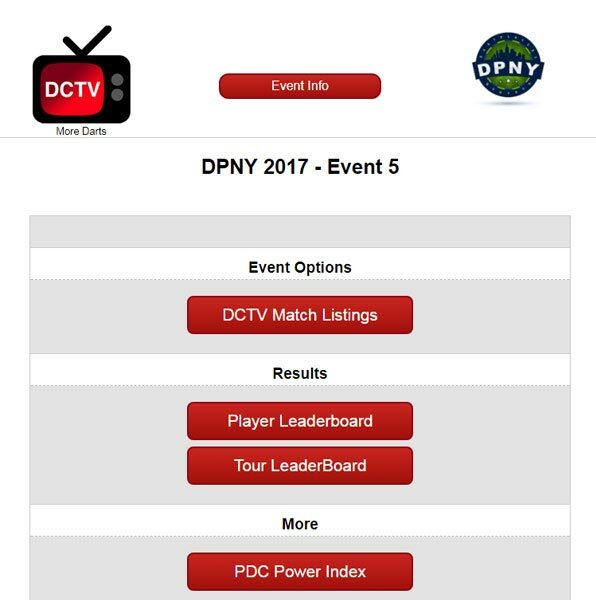 Tournament organizers can use DCTV to keep track of match progress and keep events running on time. Player performance statistics from every match are tracked and displayed on the DartConnect event leaderboard, creating a powerful and interactive way to see who is leading the field. Dozens of statistical categories allow every player to find meaningful information about their performance. With DartConnect, steel tip events can benefit from technology that until now has been exclusive to the soft-tip world. 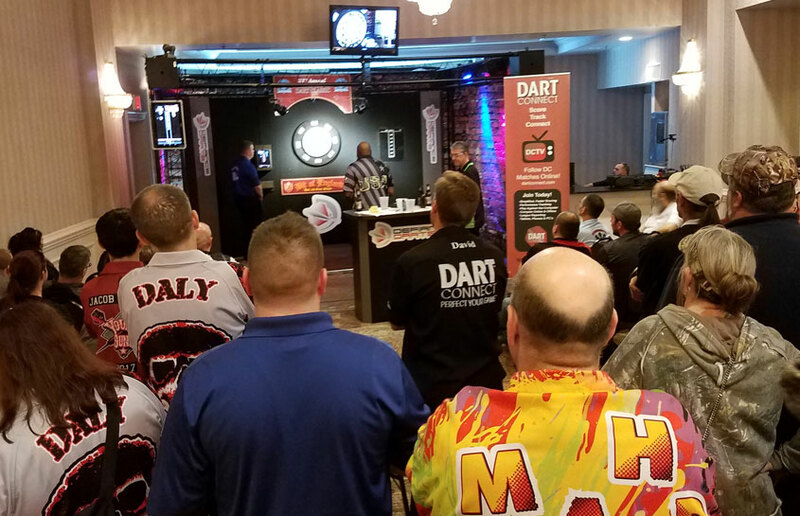 By becoming a DartConnect event, any tournament can offer players the experience they expect in the modern age in a way that enhances rather than replaces longstanding traditions. Let’s work together to get more people, to play more darts, more often. How can my event become a DartConnect Event? Depending on your familiarity with DartConnect and the level of service you require, we have options for you to do-it-yourself or have DartConnect onsite to provide services (subject to availability). First-time events are complimentary (excluding on-site services). Don’t have experience with DartConnect scorekeeping? 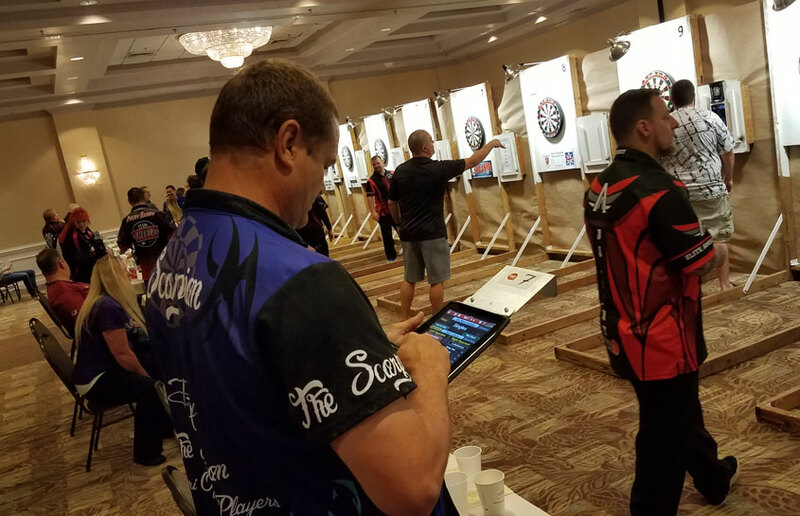 A local league may be utilizing it, and experienced DartConnect members will be bringing their own tablets. With just a few tablets, you can score random matches, along with the semi and final competition. DartConnect may be able to support you with onsite services or do-it-yourself event starter kits. Submit an event request form and we’ll be in touch with you soon. Want DartConnect to Attend? What are DartConnect Onsite Services? With DartConnect Onsite Services, a DartConnect representative will attend your event with at least 10 tablets to loan out to players. We will conduct player workshops, train staff, troubleshoot WIFI issues, and be available to score for semis and final matches. Costs for Onsite Services vary based on travel requirements. Have a vision for DartConnect at every board? 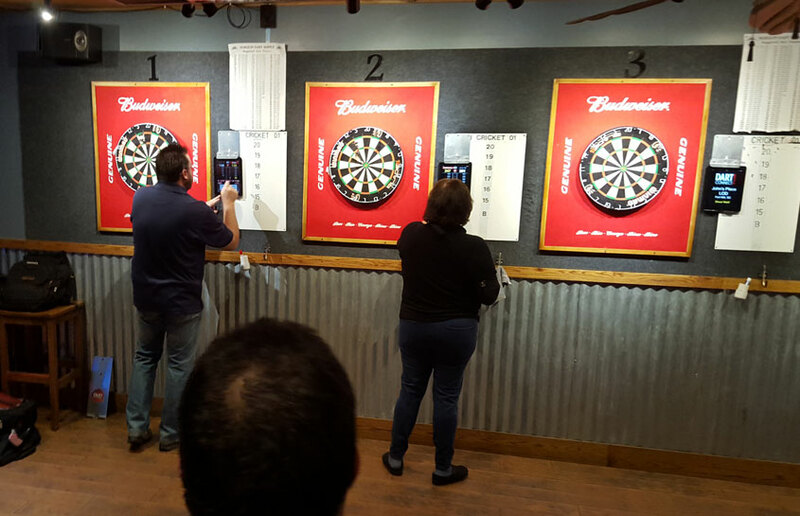 This is already happening at major tournaments in New England (50+ dartboards) and very achievable for smaller events. If you are willing to commit to making this happen we will help you do it as efficiently and cost-effectively as possible. Submit a event request form and we will contact you to discuss options. 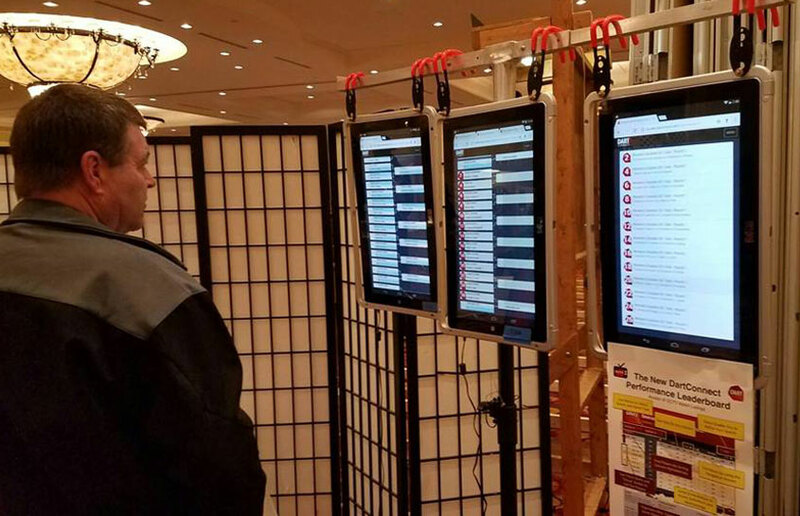 Tournament services can be utilized by having a tablet on the finals board and asking DartConnect members bring their own tablets – this how many events are run. We strongly recommend involving local league(s) that have experience with DartConnect. This guarantees a base of users with tablets and expertise. How do we mount tablets on the scoreboards? 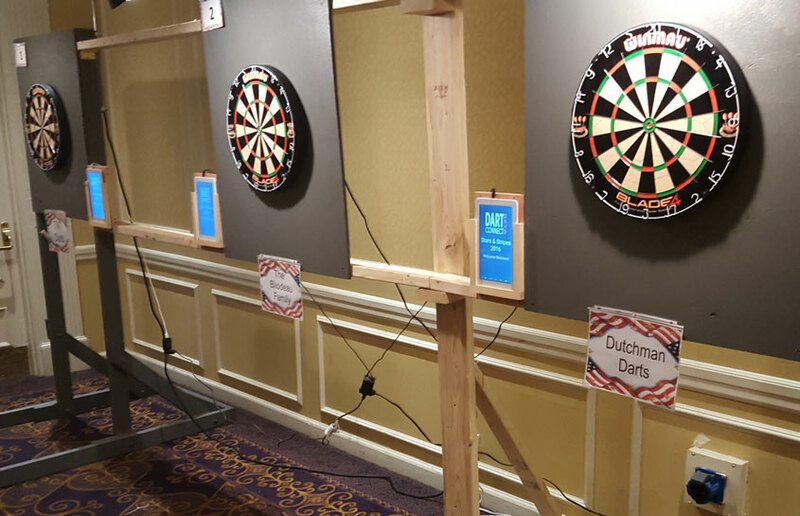 If your portable dart stands do not have chalk/eraser shelf, DartConnect can provide tablet hangers that can be used at the event, raffled or even sold to players. Any unused quantities can be returned. Contact us for details. Is WIFI required for a DartConnect Event? 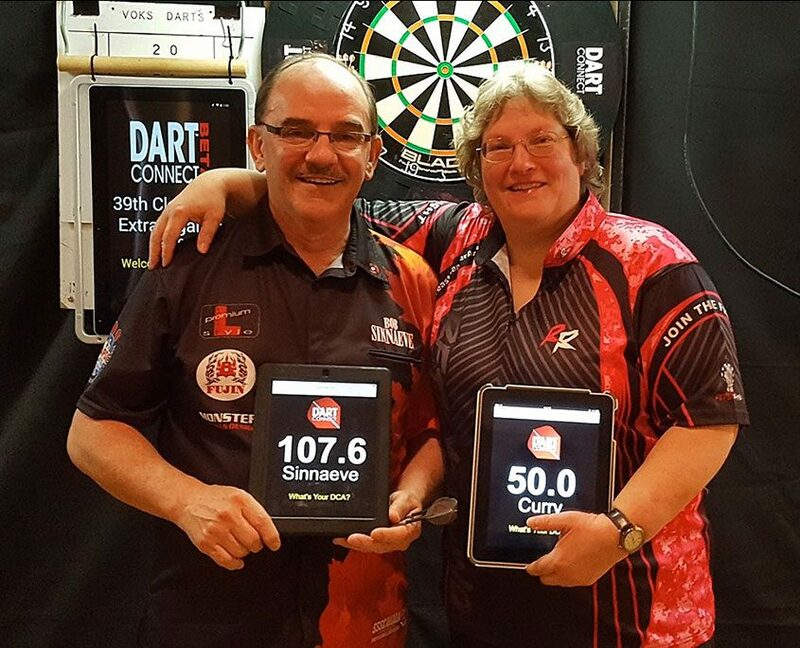 DartConnect is designed to run offline, and anyone with an active membership can bring a tablet to an event and utilize the scoring functionality. However, WIFI is required to link devices to a common event code, so that the event player roster can be shared, matches can be broadcast on DCTV, and the event leaderboard can reflect player performances. Should WIFI fail during the event, DartConnect will continue to operate, delaying the delivery of match reports and results until wifi is restored. What is required of event organizers? The first step is filling out an event request form (see below). The second step is properly promoting the event, and letting attendees know that this is a DartConnect Event. By filling out the application at least two weeks in advance, we will do our part, by listing your event on DCTV and social media. Event Check-in begins the Monday before your event. It is critical that you promote this on social media by providing a direct link to our web page. This will pay dividends in increasing attendee awareness and pre-building your player event roster. How do help players who are new to DartConnect? DartConnect’s “How to Events” section provides information for both new and experienced players. Include our link in your promotion and correspondence to get players up to speed before the event start date. Does DartConnect offer video streaming services? Although we do not provide video streaming services, many tournaments intergate DartConnect into their video stream to provide a professional broadcast. We can consult with you and put you in touch with other tournament organizers and service providers who can advise you on best practices for providing a live video stream at your event. If you have not used DartConnect for your event before, DartConnect will arrange for a free trial. In addition, if you are a Partner League, you receive two basic events per season. Is DartConnect available to come on site with tablets and run the event? DartConnect representatives are available for a handful of events every year. The two key factors are scheduling and travel related expenses. Contact us early, and if scheduling allows, we will determine how we can work together to mitigate the travel expenses. All tournament services provide the option of a online check-in (registration) to build a public tournament roster that can be shared between devices. This player list, enables DartConnect to score, broadcast and deliver match reports to participating players. First time events receive basic tournament service for free! Simply fill out the request form. In the meantime please fill out the corresponding request form and we will do our best to accommodate your event. First Time Events are Free! We are looking forward to finding out more about your event! Simply fill out the request form, and we will be in touch to see how we can best support you. Back for a Repeat Event? Welcome Back! We look forward to making this event even better than the last. Please notify us at least two weeks in advance, so we can promote your event. Attending a DartConnect Event? Make sure you Check-In and add yourself to the player roster! How do I check into an event? Use the “Tournament Check-In” link at the top of the page. There is also a link in the Tournament section of the app. Select the event(s) you are attending, then continue. Enter your email address, and if this is your first time ever checking in, enter your first and last name when prompted. Pro Tip: Help keep events running smooth by checking-in a few days early, it takes less than a minute and can be done with your phone. The check-in page will also highlight if an event is providing tablets for all boards and a list of players who have already checked-in. How far in advance can I check in? Check-in is typically available 5 days prior to the event start date. Why should I put my name in the player roster? Note: DartConnect check-in is entirely separate from event registration, you will still need to sign up and pay any fees at the tournament registration desk. What if a player didn’t check-in and is missing from the roster? Tap the red “Update Roster” button to make sure you have the most up to date roster. If the list exceeds 50 names, it will be broken out by last name–tap the letter in the center column to jump to matching last names. Drag on the black area in the center to scroll longer lists. Tap “Player Lookup” and follow the on-screen instructions. If a player match appears in the white box, confirm identity by email address and tap the name to add them to the roster. If no match appears, add them manually by tapping “Player Not Found…Add A New One”. Pro Tip: If a player has the letter “i” next to their name, there is no email address listed for them, tap the “i” to add an email address for match reports to be delivered. Can me and my friend use the same email address? E-mail addresses CAN NOT be shared by players and must be unique. Players can be entered without an email address but will not receive match reports or appear on leaderboards. Pro Tip: Email addresses are free from services such as Google, Hotmail and Yahoo. Some players create a brand new email address just to use for DartConnect. How do I pick players and set up a match? Select opponents for each side of the scoreboard. Tap multiple opponents to play doubles, triples, etc. When picking players, pick one team from the list on the left and one team from the list on the right. Selected players will be highlighted with a red background and their names will appear at the top in gold. Reset picks or tap a player again to deselect them. What if a player is missing from the event roster? Note: E-mail addresses can’t be shared by players and must be unique. Players can be entered without an email address but will not receive match reports or appear on leaderboards. DartConnect displays the options for each set before the match begins so participants can verify or change if necessary. If the participants, game, or number of legs is incorrect, simply tap the incorrect variable, and adjust it as needed. What if the game has already started and we notice an error? Once a leg is underway and you notice something incorrect, you can still make a correction by selecting either BACK or CANCEL to access the settings for the leg. If a turn has already been recorded, tap the “X” on the red bar, delete the leg, and start over. Note: Deleting the leg will erase the scoreboard. If you want to preserve this, record it (take a picture) and recreate it when you return to the leg. After the first leg, how do I start the next leg? For team games, how does DartConnect know which player shoots first? For doubles, triples and quads, at the beginning of the leg, all names will appear on the scoreboard in gold buttons. Tap the buttons in the order in which the players are shooting. In subsequent legs, if the player order doesn’t change, you can tap the green button “repeat throwing order” instead of re-picking players. See the wrong name appear for your turn? At any time during the leg, tap the player name field to access the gold name buttons and correct the player order. What should I do at the end of a match? When the final leg is over, the end of match screen will appear with the final score. You can choose to save the match by tapping the “Save Match” button, or the match will autosave after a 60 second countdown. Once the match is saved you can review the end of match summary and then tap the “New Match” button to reset the device for the next match on that board. 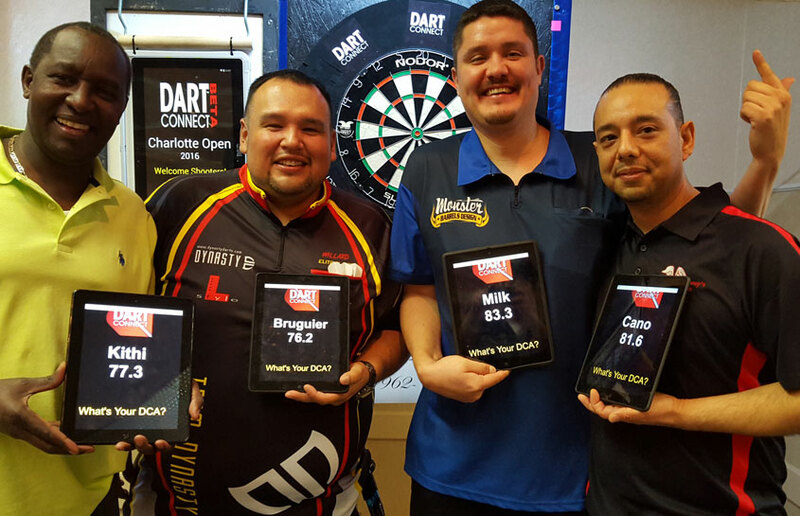 Experienced DartConnect Premium members may bring their own device to score matches at events that don’t have tablets for every board. Follow these guidelines to ensure a smooth experience. How do I connect my tablet to the event’s wifi network? Pro Tip: Premium members should check-in early and log into the tournament before you leave for the event in case you must score matches offline. First, ask a tournament organizer if the wifi network is available for those using DartConnect. If access is not provided, you may need to use your device’s data plan or pay for personal WiFi access. If no WiFi is available to you, you can use DartConnect to keep score offline, but you will not be able to log into the tournament or access the event player roster. Match data will be stored on the device until it is connected to WiFi. If the WiFi password is shared with you, open your device’s settings and connect to the WiFi network. Open your web browser to a website such as bing.com to confirm you are connected to the Internet. Continue reading for additional advice. Pro Tip: Make sure your device is connected to the WiFi network to be able to access the tournament and updated player roster. Your Premium Membership account will unlock the event inside the Tournament section of the scoring application. Check for Updates and you will see a green button for the event once it has become active. Before the event start date, the tournament will be listed as an upcoming event. Once the event is active, tap the event button to have access to tournament settings and the event player roster. What Tournament Type should I select? When you first open the tournament in the app, you will be asked to “Select Tournament Type”. The vast majority of events are “Elimination/Knock Out” but ask the event organizer if you are unsure. What are the Advanced Match Settings and how do I use them? Pro Tip: Advanced match settings are most helpful in streamlining long format, alternate start singles events. Settings can be reviewed and changed from the leg selection screen. “Edit Match Settings” can be accessed on the player roster or leg selection screen. Note: You must remember to re-adjust settings before events that use a different format. Select Game Type – here you can control how often the game menu appears allowing you to change the game being played. Every Leg – Select this to show the game menu before each leg starts, use this for events such as Chicago Format or 501-Cricket-Choice. Once Per Set – Select this to show the game menu only before each new set begins. Use this for events that only play one game type such as “501 Singles” or “Doubles Cricket”. Once Per Match – Select this to show the game menu only before each new match begins. This is typically used for “Set Play” but can also be used if the match consists of a single set. Select Player Start Format – here you can automate the starting format. Alternate –will automate alternate starts and keep track of whose turn it is. Check with organizers if Cork First Match Leg and/or Cork Last Match Leg applies. Cork –will have the “Shoot for Bull” screen appear between every leg. Select Player – will have the “Select Player” screen appear before every leg. Show All Starting Options – will show options for Alternate, Cork, Select Player and Mugs Away (loser of previous game shoots first). Where can I purchase a tablet hanger to use at events? Pro Tip: Hanger top for tournament stanchions is removable for flat mounting on walls. Rare-earth magnet clip secures many size devices. Official DartConnect metal tablet hangers are available online from A-Z darts. These DartConnect-branded hangers feature durable construction, three mounting options and fit up to 14” tablets. What should I do when the event is over? Pro Tip: Double-check that your event matches are saved and synced to the server so that member accounts are credited, match reports sent and leaderboards updated. When the event is over, make sure you exit the event and return to the Welcome Screen to continue your non-event play. Check DCTV and the event leaderboard to review your performance stats compared to other competitors.